Our Workhorse mobile chart binder racks are built to last! 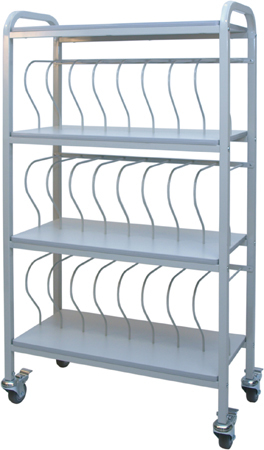 Charts & Carts complete line Workhorse Series mobile chart racks are specifically designed for convenient chart ringbinder storage. Our carts provide organization and smooth edges provide protection against ring binder wear & tear. Available in 10, 15, 16, 20, 24, 30 space models. Charts & Carts offers the most comprehensive selection of chart binder carts available. Contact us for personal assistance in determining the best chart rack solution for your medical facility. SKU # MCBR-15, Charts & Carts - Workhorse Mobile Chart Binder Storage. SKU # MCBR-16, Charts & Carts - Workhorse Mobile Chart Binder Rack. SKU # MCBR-30, Charts & Carts - Workhorse Mobile Chart Binder Storage.